The first winner in 2009 was Donna Reimer who devoted her life to others. Whether it was caring for her wheelchair-bound husband or helping her two adopted children find their birth mother, Donna was always there. Last year’s winner, Stephanie Flood, fought and won her battle against an aggressive cancer four times. Her story alone was so inspiring, yet it was her involvement with Children’s Memorial Hospital and the American Cancer Society that elevated LOVEbug beyond a simple car contest. 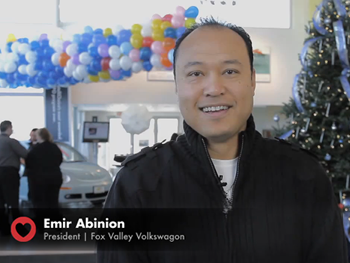 "It was then it became clear how effective non-profit organizations are at creating warm, supportive communities that rally around an individual," said Emir Abinion, Owner, Fox Valley Volkswagen. "It was time to acknowledge both an inspiring individual and a deserving non-profit." So this year, the LOVEbug3 Share the LOVE Contest is shifting gears. Fox Valley Volkswagen is giving away TWO 21st Century Beetles. One is going to an individual in need of a new car, and the other will be awarded to a non-profit to sell, raffle or auction, with the proceeds going back into the respective organization. In a struggling economy, non-profit donations often get put on the back burner, but it’s in these times that they need them the most. "Only one is going to win the car, but they will all be featured in a contest that creates awareness of their organization and gives them free exposure," said Abinion. "In the end, everyone wins." For the non-profits, the nominations give them another outlet to reel in volunteers and donations. For individuals, the nominations are a way of saying "thank you for all you do". But they both come together under one mission: Share the LOVE.